Tagged under Aya Nakahara, Toei Animation, Series. Risa Koizumi is a first year student who is very tall compared to the other female students, and has never had a boyfriend. But Risa has a nemesis: Atsushi Otani, a boy who is shorter than her. The two are dubbed by everyone "All Hanshin Kyoujin" (duet of Japanese comedians where one is tall and the other is short). As the two continue to annoy each other, Risa makes a discovery: she is in love?! And with Atsushi even! Will she be able to overlook their difference in height? How will Atsushi react? And who is this guy that says he's a childhood friend of Risa's? 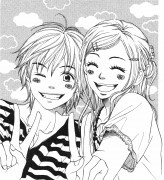 This is definitely a manga not to miss if you love the combination of love, humour and kissing scenes (joking...). The sweetness of the couple dating, the sacrifices made from both parts, the hardships they come through to this well earnt love is definitely something worth watching. the scenes and the plot are really enjoyable, although at times it may seem a bit repetitive. very enjoyable, and made me hooked onto it and couldn't stop reading. 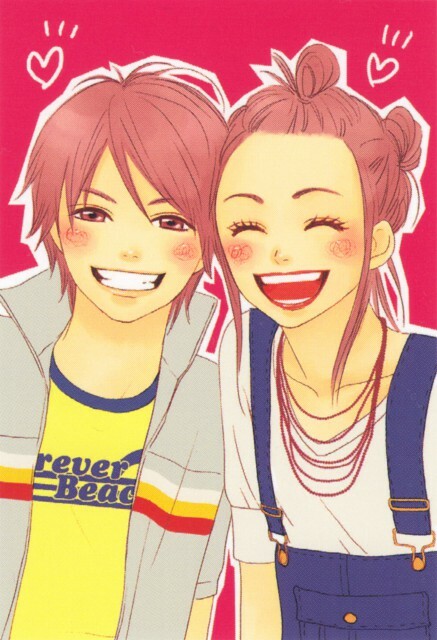 I'm not a big fan of shoujo but this one has an amazing story. I really love this, this series is different from other shoujo anime, it is telling a story about the tallest girl and shortest boy in school. 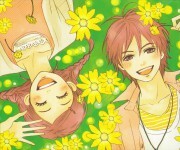 I think this is the first shoujo anime that I enjoyed watching. I can't count how many times I laugh while reading this manga. LOL! I've read a lot of shoujo manga and I found that the main female characters were mostly annoying, but not in this anime. The artwork is beautiful and clean, the animation is great as well. I must say, for the ones who like shoujo anime, I really recommend this, it's worth watching. One of your regular shoujo stories. The story and characters were cute and all but nothing to write home about. I'd suggest to watch it when you have nothing better to do and if you're in the mood for some cheesiness. Personally, I like the manga better. The problem with anime is they destroy the perfection in manga. The character designs in anime doesn't really appeal to me, but I'll give credit to the studio for using new coloring technique on the characters. The presentation are not bad, great line of voice actors and it also got interesting plot. It's funny and enjoyable, yet it'll make the female readers blush in Koizumi's place both by her klutz and brave actions. I remember the times when I'm still watching this... I was laughing. I also remembered that I was annoyed at some point of the series. What I like in this series were the height difference thing, the comedy tandem and the kisses. The kisses are just so cute. It was a very romantic anime, nonetheless, a very funny one. I enjoyed the series. I haven't read the manga yet though.